Dubai, July: Swing Yoga has become increasingly popular in recent years. A combination of traditional yoga poses with the use of a gravity – defying hammock, it’s the perfect class for anyone looking to get into Yoga. 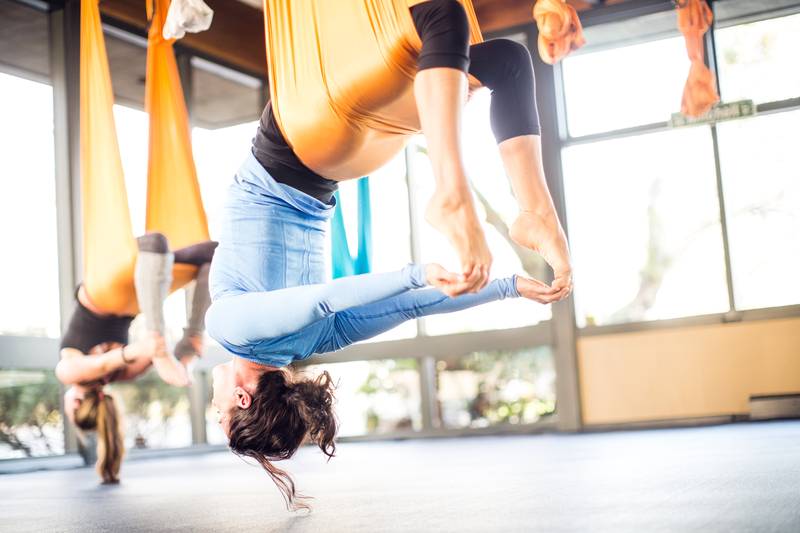 Two adult women practices different inversion / anti-gravity yoga positions in a bright well lit studio. This form of yoga uses a hammock attached from the ceiling, excellent for the spine, accessing unique core muscles, and improving circulation and lymphatic flushing. Here the woman stretch behind their backs to grab their ankles. The hammock can support up to 300kg of weight and is attached to the ceiling hanging to less than 1 meter from the floor. The hammock acts like a swing and soft trapeze, supporting the hips for forward and back bends. Yoga postures which some people may find difficult to do on the ground can be easier without the added pressure on joints. Swing Yoga is the perfect beginners starter class and helps correct mistakes in the body to help you perform standard Yoga poses properly. 3.What benefits can I expect from Swing Yoga? The benefits of Yoga are different for every person. Everyone has different abilities in strength and flexibility. Some people may have injuries that they would like to help correct, so it depends on the intention of the person and what benefits they would like to take from the class. Many people love the feeling of freeness and say it boosts their mood. Others have said that Swing Yoga helps improve their balance and stability in daily activities. Swing Yoga opens up the hips, shoulder joints, and rotator cuffs. It can also provide many health benefits including the betterment of the endocrine, circulatory, lymphatic and nervous systems. As well as this, the thyroid system is massaged reducing inflammation and stress within the body. Swing Yoga can also lessen the side effects of female hormone imbalances and the inversions increase oxygen blood flow to the face which helps with ageing as skin cells are nourished. The parasympathetic nervous system is positively stimulated, promoting a feeling of calm and deep wellbeing. Alternatively classes may be booked by via the Fitness First Mobile App.